What Type of Glue Do You Use on a Flower Pot? Many flowerpots are made of terracotta, which is a type of fired clay. Terracotta is easily recognized by its rusty red tinge and is typically unglazed with a matte finish. Terracotta flowerpots are porous and should be glued together with adhesives intended for porous materials. 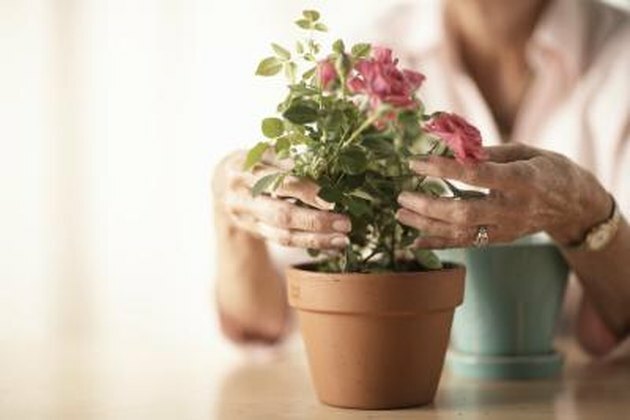 Gluing objects onto a flowerpot requires an adhesive that works on both porous materials and the accessory object; for instance, a piece of smooth glass. No matter what the flowerpot is made from, choose an adhesive designed for that specific type of material. Use glues intended for porous surfaces when working with terracotta flowerpots. Cement adhesives are sold under many brand names, oftentimes as patio or garden adhesives, at home improvement, craft, hobby and hardware stores. Cement adhesives are used for objects that may be exposed to the elements, such as water. Terracotta flowerpots, as well as ceramics, pottery, cement and stones can benefit from the use of cement adhesives because these types of glues can tolerate temperatures ranging from -45 degrees Fahrenheit to 150 degrees Fahrenheit. For best results, when repairing a broken flowerpot or gluing decorative embellishments to the pot, lightly sand the area to be glued (and the back of any embellishment if applicable) with fine-grit sandpaper to create texture for better bonding. Press the object onto the pot or press the broken pieces together. The pot should not be handled for a minimum of two hours and will not be permanently glued for about 72 hours. Use cement adhesives with extreme caution as many contain the toxic chemical, tetrachloroethylene. Ingestion may be fatal. Inhalation causes neurological complications, among other dangers. Silicone caulk is a waterproof method of adhering embellishments to a flowerpot or for repairing broken pots. The area to be glued should be cleaned and dried. For repairing broken pieces, apply a layer of caulking to the edges of the broken piece, and fit it back into position, pressing firmly. Use wire or a large rubber band to hold the piece in place until the caulk is completely dry, according to the duration specified by the manufacturer. Silicone caulk may be used to adhere embellishments to a flowerpot. Use fine-grit sandpaper to sand the surface to be glued to create texture for better bonding. Apply a thin layer of caulk to the back of the object, and firmly press it to the pot. Use a rubber band or wire to hold the object to the pot until dried. Use a razor blade to scrape off any unwanted silicone caulk. Old-fashioned school glue, also known as PVA adhesive, is formulated for use on porous surfaces such as terracotta flowerpots. PVA adhesives are easier to clean than most glues intended for use on ceramics and terracotta and wash away with soap and water. The drawback of PVA adhesives is the product's lack of waterproofing. When wet, most PVA glues will fail. PVA adhesives are not good glues to use on outdoor objects because not only are most of these glues not waterproof, but they also fail to withstand cold temperatures. PVA adhesives will not cause harm to your skin or respiratory system but are toxic if ingested. Some brands of PVA adhesives are waterproof, and these will specify this trait on the product label. When affixing objects to pots or repairing broken pieces, apply the glue and use a clamp, rubber band or other method to hold the pieces together for about four hours. The use of hot glue to affix objects to a flowerpot or to repair a broken pot is only intended for decorative use. Lightly sand the back of any embellishment to be glued to the pot and the area the item will be glued to with fine-grit sandpaper to rough up the surface for easier bonding. Use caution when operating a hot glue gun to avoid burns. Wipe away any excess hot glue before it cools to avoid dried glue webs on your project. Can You Grout Plastic Flower Pots?